The meteoric ascent of Kuala Lumpur from a mere inland mining centre to the administrative capital of the Federated Malay States receives masterly treatment at the hands of John Gullick, the indefatigable chronicler of Malayan modern history. 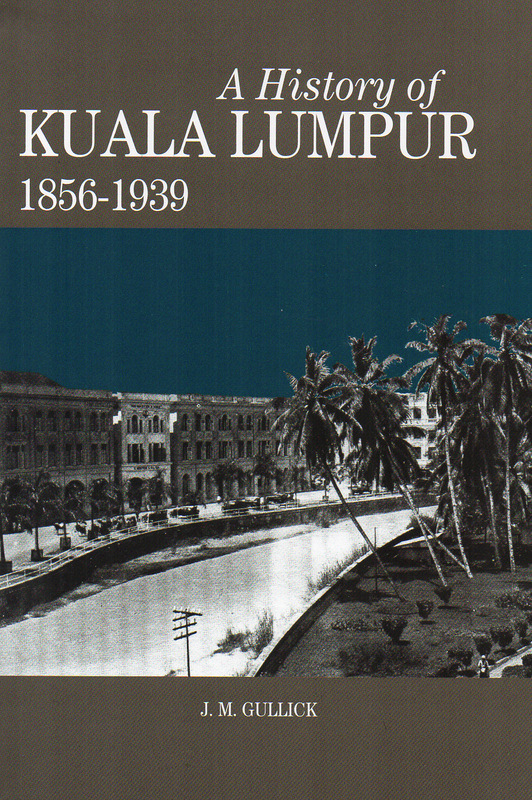 Gullick's account of the historical development of Kuala Lumpur is a natural companion to his History of Selangor 1766-1939, published in 2004, and as far as possible should be read together, for the latter provides an illuminating foil without which one's understanding of the organic development of Kuala Lumpur would be incomplete, as Kuala Lumpur had originally been part of Selangor and had, in fact, become its state capital from 1880 onwards. Opting for a characteristically placid narrative style - carefully avoiding the lumber of historical jargon and complicated theories - Gullick proceeds to examine various aspects of Kuala Lumpur history through a number of broad themes chronologically ordered. The reader is taken from the first opening lines on a fascinating odyssey of the capital's rise from humble and turbulent beginnings in the middle of the 19th century to its pre-eminent position as the socioeconomic and political hub of Malaya on the eve of the Second World War. Almost nothing escapes Gullick's meticulous scrutiny, from the construction of roads, bridges, stately public buildings and parks to amusing anecdotes about the great and the good, presented objectively and without a hint of bias or priggish self-censorship. Gullick intersperses his account throughout with a judicious selection of excerpts from rare sources otherwise difficult to obtain in the form of long-forgotten articles, memoirs, private journals and letters. The inclusion of Appendix A - reproduced verbatim from excerpts of a 1954 special supplement in the Malay Mail - in the form of recollections of Edith Stratton Brown and Basil Joaquim of early Kuala Lumpur is especially valuable. Gullick's book describes Kuala Lumpur's changing physical, cultural and social setting, and the emergence of new business undertakings, health regulations, and recreational facilities. Readers will be treated to a thoroughly detailed account of early efforts to lay out the city, the expansion of the city's limits from what is currently Chinatown to the area around the Selangor Secretariat buildings which became the heart of the federal capital, and beyond. Drawing on personal memoirs, archival sources and published accounts, Gullick documents how each of the local community - Malay, Chinese, Indian and others - developed a strong interlinking network and responded to the remarkable forces which transformed Kuala Lumpur into a thriving urban settlement within a few decades of its existence. A History of Kuala Lumpur traces its pedigree to a longish article which originally appeared in the JMBRAS in 1955 but was later reworked by Gullick into a full-length book with a broader timeline. First published in 2000, it has been out of print for some time. On the back of growing demand for historical material on the history of Kuala Lumpur, the Society feels that it would be apt to offer Gullick's much-loved account of Kuala Lumpur once again to the public. Amply illustrated throughout, the book will once again fill a perceptible gap in the historiography of Kuala Lumpur. Not only would this volume appeal to historians, first time visitors to the capital and the casual reader, but policymakers and urban planning experts looking into the origins of contemporary urban issues will be rewarded by fresh, challenging insights should Gullick's enduring account be subjected to a degree of scrutiny it really deserves. Monograph No. 29 - A History of Kuala Lumpur 1856-1939 has been made possible through the benevolent support of Think City, an urban regeneration vehicle which is currently involved in efforts to revitalize the historical core of Kuala Lumpur and surrounding areas. John Michael Gullick was born in February 1916 into an affluent Bristol family whose circumstances were altered later by the slump in 1932. Having won a free place at Taunton, a boarding school in Somerset, Gullick's scholarly inclinations became distinctly apparent when he was awarded an open scholarship to Christ's College, Cambridge from which he emerged in 1938 with a Double First in Classics. Gullick joined the Colonial Administrative Service in 1939 and after the war - in which he served with some distinction - found himself transferred to the Malayan Civil Service in which he would serve for the next decade or so of his long and eventful life. Gullick joined the MBRAS in 1947 and sat on its Council in the 1950s before finally becoming one of its International Advisory Board members and the Society's representative in the United Kingdom. After his retirement from the Malayan Civil Service in 1956, Gullick's career path took an unusual turn when he became a company secretary after which, in 1963, he went into legal practice (he had qualified as barrister in the 1950s but opted for solicitor work), unorthodox career moves that left an unmistakable quality on his writings and burnished his subsequent credentials as a formidable authority on Malayan history. Works written by Gullick subsequent to this period have been unrivalled by even professional historians, and he woved a dazzling tapestry of brilliant scholarship and thorough research that became the envy of many professionals in the field. As the author of numerous articles and books on the modern history of Malaya, Gullick's contributions to its scholarship were widely acknowledged but he remained in private life a modest and self-effacing man. The last in a long and illustrious line of scholar administrators who had inestimably enriched the field of Malaysian history, Gullick died at his home in Essex in April 2012.